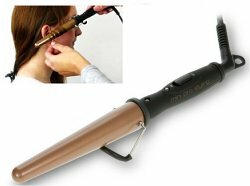 Add some seriously stylish curls easily to your hair with the Mini Pro Styling Wand. The argan oil infused ceramic barrel will ensure your beautiful curls will look and stay sleek. This is perfect to take on holiday, or throw it in your bag if you need to switch up your hair style during the day. •Creates beautiful drop curls from a compact styler. •Super smooth ceramic barrel infused with Argan Oil. •30 second instant heat up to 200°C.